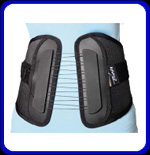 Female BOA Back Brace (75degree) – Pacific Medical, Inc. Designed with the female shape in mind. The Female BOA incorporates the hourglass shape with the patented closure mechanism to provide comfortable, controlled compression of the lower back. The 75° Female BOA adapts to the anatomy and may also be integrated with the chairback frame. Lordotic inserts may be used for added comfort.